This book is an extension of “Brothers” – ” the idea is to fill with a non-fictional narrative, the gaps in this story” – but also to analyze in depth the main topic of “Brothers” : in forty years, from the Cultural Revolution to nowadays, China has undergone tremendous changes and transformations that, in Europe,have needed several centuries to take place. These ten words are: “Like ten pairs of eyes … to scrutinize the current China under ten different angles”.The main quality of this book is that, on the basis of daily life, it merges the political and economic analysis with the history and personal experience of the writer. The first essay, “The People”, includes part of the excellent article that Yu Hua has written for The New York Times on the occasion of the twentieth anniversary of the Tiananmen Square crackdown. Ihe tells us about Beijing during spring 1989, an “anarchist paradise” where the police had disappeared and the students and people had spontaneously taken over. ” We have the impression to read again some texts concerning May 1968 in France! Yu Hua is back to his youth during the Cultural Revolution. Only a few books are allowed, others are read and shared so much that the first and last pages are missing; it stimulates the imagination, it may be the origin of his vocation. This developped by reading and production of posters (dazibaos) informing against or defending teachers or neighbors. But he managed to avoid becoming a “red pen”, a writer in the service of politics and trying to follow its unpredictable reversals. A lot of humor to explain his work as a dentist: it is to stop pulling teeth that he began to write. The release of one of his short stories by a Beijing magazine and his visit to the capital, allowed him to be transferred to the Cultural Center of his small town of Haiyan. As pointed out recently, the writer Lu Xun, “taken over” after his death by Mao Zedong, had become a political reference. Yu Hua, an undisciplined schoolboy, explains how he used the tune of the time, “Chairman Mao teaches us and Mr. Lu Xun said,” to defend incredible lies. But Lu Xun is also a great writer that he discovered in 1996 and Kong Jiyi ( in the collection of “Cries”) is his model for the short story. Things have changed … but the major point is the phenomenal growth of inequality: it is not during Mao’s time, it is in “today’s China that the class stucture and class struggle became reality”. This shortcut seems to forget too quickly the social structure of the post war period, but we will gladly agree with Yu Hua when he emphasizes that the public is: “not interested in the fate of some 100 million people living in unimaginable poverty. Our real tragedy may lie there: not seeing that poverty exists is even more terrible than the poverty itself “ . For the author, the incredible economic development in recent years is the latest rebirth of revolutionary violence: expensive and unrealistic programs managed by the provincial governors and overcapacity in some industries which are currently worsening. The willingness of “little people” to make money has replaced their revolutionary energy. The Cultural Revolution led to a redistribution of political power, the capitalist development has opened a redistribution of economic power. But it is today dangerous to be rich as it was risky to succeed in politics and being close to Mao ! To support his statement, one could also compare the reactions in China to the current economic crisis,with those that take place in Europe and the United States. But Yu Hua is not optimistic; after Tiananmen in 1989, the political system reform has been stopped while the economy started a very fast development. The book will be published neither in China nor inTaiwan. Paragraphs on Tiananmen, on the leaders or the contradictions in China are too biting. Yu Hua thinks that he is sufficiently famous in and outside China to allow himself to cross the yellow line, rather timidly, moreover, because the central problem of the power monopoly by the Communist Party is not touched. This is not a controversial and schematic book for a Western audience. It is a fascinating book, elegantly translated by Angel Pino and Isabelle Rabut, his “usual” translators who have worked hard in France for the success of Yu Hua. 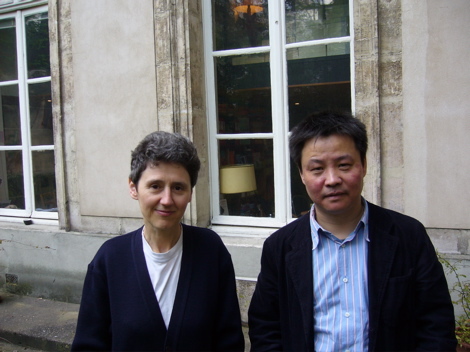 “La Chine en dix mots” by Yu Hua – translation Isabelle Rabut and Angel Pino – ed. Actes Sud, 370 pp., 22 euros.